DISCLAIMER: As much as I love fields of flowers and smiling children, sometimes I need to step out of my comfort zone and get a little crazy. If you are offended by zombies, specifically child zombies, please go check out this cute tea party post. This week I received a message from an awesome mom interested in a zombie-themed photo shoot for her family. 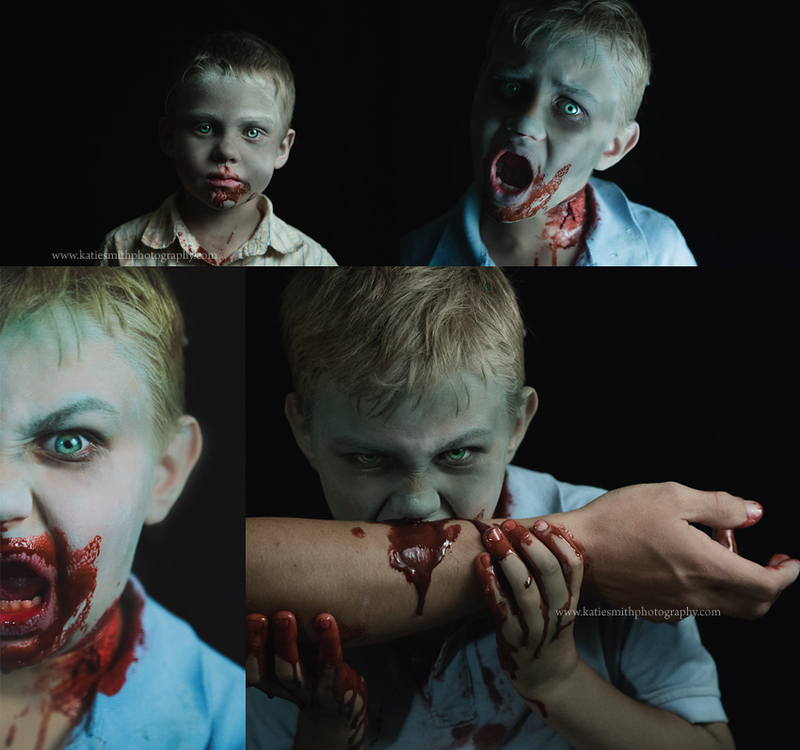 It encouraged me to dress my own children up like zombies for a delightfully disturbing photo shoot. While I waited for my oldest to get out of school, I made the fake blood using sweetened condensed milk, chocolate syrup, and food coloring. (I might have ate a spoonful or two of “blood.”) I found some of their clothes that were torn or stained and tossed them in the dirt then jumped on them for good measure. My three year old is very skilled at getting dirty and had no problems helping me ruin what used to be an Easter outfit and a school uniform. Everything was going to be perfect. We just had to wait for my oldest. Once my six year old was home, we started make up. I learned that I like the Halloween style face paint that looks like crayons over the regular face paint like you would see at a carnival. It blends a lot better. Thanks to watching several online videos, I knew the basics of zombie makeup. Darken the hollows, added in greens/browns/yellows, and never skimp on the blood. Then it was time. My kids ran out the door like zombies racing for the last brain. I’m sure my neighbors decided we had lost our minds (we probably have). Right as we were set up, I heard it. Thunder. A storm was brewing and it would be here soon. So we ran to the field, did our best zombie impressions, crawled across the ground, and raced back in the house just before the rain hit. When the rain didn’t pass quick enough, we took the zombie party to my office for some gory headshots. The nasty looking neck wound is courtesy of my husband… so is the severed arm. No children or dads were harmed in the making of this photo shoot. Katie Smith is an on location family and couples photographer. She offers fun themed photo sessions based on a family’s interests. Katie Smith is a huge fan of zombies, using imagination, and just being weird in general. I’m not a fan of zombies, per se; but I am a fan of kids having fun and it looks like they definitely did! You are very talented and I always enjoy your creative ideas.